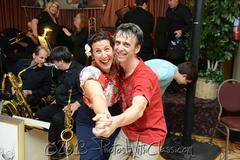 EVENING SWING DANCES WITH LIVE MUSIC! "I have to say that last night was fantastic! The band was incredible and the dancers full of joy. 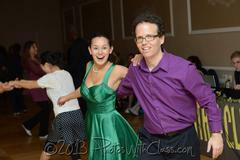 Thanks, Rusty, for creating this place we can go and dance all our troubles away!" 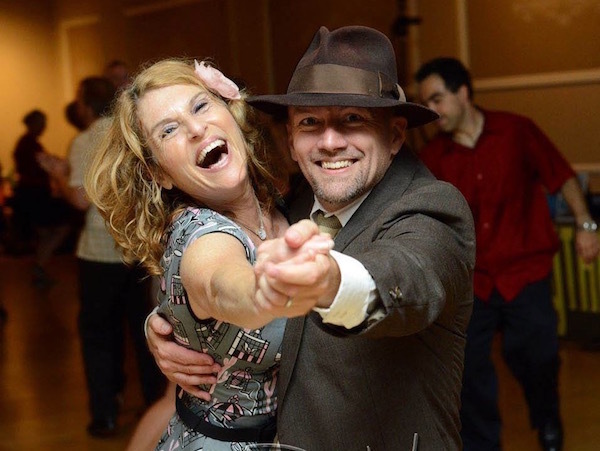 Rusty's weekly swing dances feature the best of live music and great DJs for continuous dancing. 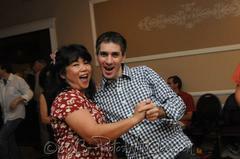 Enjoy your choice of a beginner or intermediate class before each dance. Bring a friend or go solo, and you'll have a great time either way. Add to that birthday dances and other special performances and you have a winning evening! Note: On the week of our First Friday dance, there is no Wednesday dance. Visit our Calendar to see what's coming up. The Elks Lodge, 8025 W. Manchester Avenue, Playa Del Rey CA 90293. Park and enter in the back. See who's playing at Rusty's in the Future. why not come out and take advantage of our $10 cover after 10pm. Pick up your Dancing On Air card at the Rusty's and start getting your stamps towards free dances. A perfect birthday present for your dancing loved ones, or just a nice gift to say, "Come on! Let's dance!" Pick gift cards up from Rusty or from one of her cheerful minions at the club or class. Like admission to Rusty's, the Gift Cards may be purchased for $15 each and are good on the Wednesday dances. For more information, Email Rusty or call 310 606 5606. Enjoy this short movie of Rusty's. We hope you'll join us soon on the dance floor! July 15, 2009 at Rusty's. Not sure how to ask someone to dance, or how to be asked to dance, or what to wear, or other social dance etiquette? Check out our Swing Etiquette page. 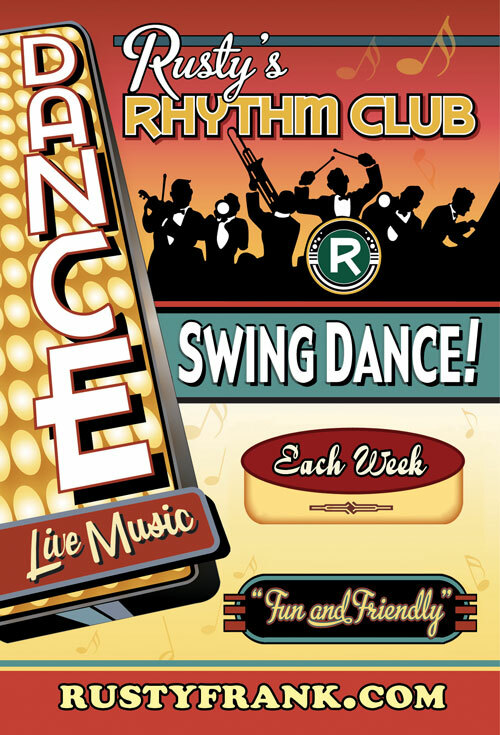 LIVE SWING MUSIC FROM THE 1920'S TO THE PRESENT! 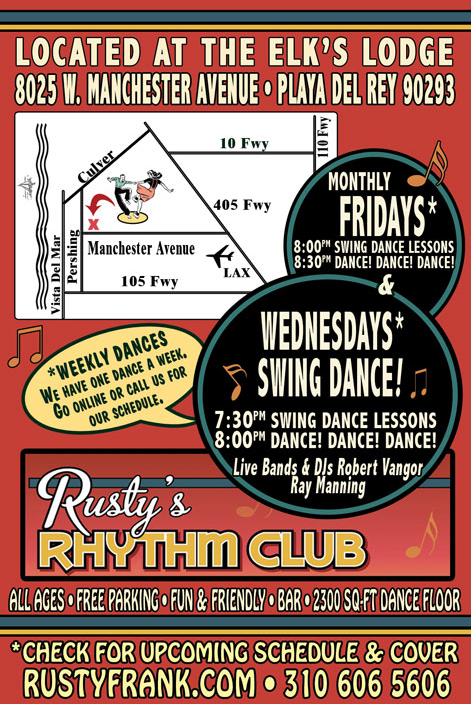 At Rusty's, each week we strive to present the best of swing dance music for your dancing pleasure. 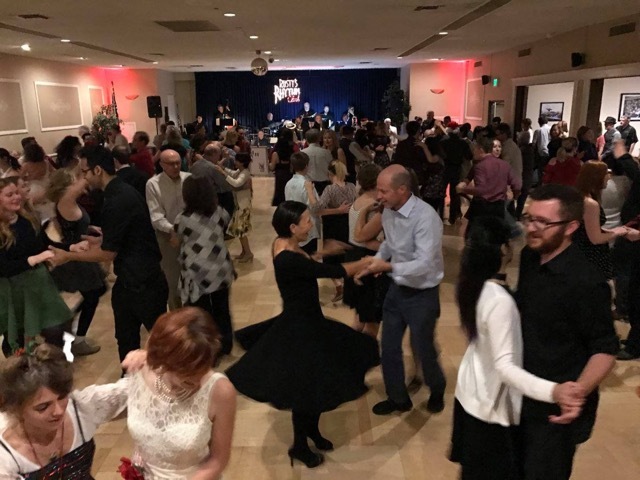 In realizing that dancers have varying taste in their swing music, we present a wide range of music styles from over the decades: vintage swing, big bands, small groups, Rockabilly, Rock 'n' Roll, Doo Wop, Neo Swing, West Coast Swing, and just everything in between. Really anything from the 1920s to the present that will get your feet dancing, that's what we bring in!